Nearly 50 earthquake-damaged buildings in Wellington have been inspected by engineers, with some likely to be closed for weeks or longer, and one may require demolition. Yesterday people were asked to stay away from the CBD after several multi-storey buildings were damaged, and glass fell into streets on Monday. Many of the damaged buildings were on reclaimed land on Wellington’s waterfront, including the BNZ and nearby Statistics New Zealand building. A BNZ staffer was told it would be at least a week before they returned. 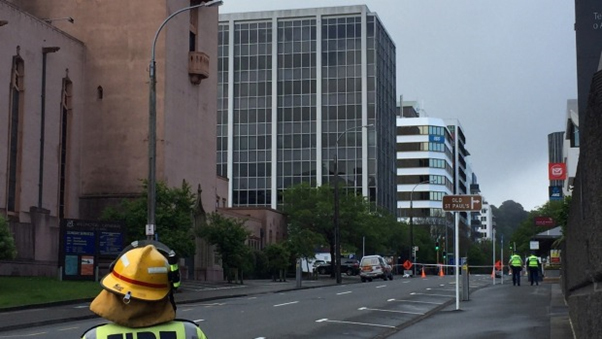 A 10-storey building in near the Parliament building on Molesworth Street, which is at significant risk of collapsing, survived the night and its future could be determined today, according to Wellington Mayor Justin Lester. The building, located at 61 Molesworth Street, was cordoned off yesterday after engineers doing post-quake checks discovered a fractured column (Figure 2). Civil Defence said this morning there had been no further earthquakes that had threatened the structure of the building, but the cordons could stay in place for days, or even months. However, Wellington Mayor Justin Lester says a decision on whether the building has to come down could be made as soon as today. He said he did not know whether the building could be repaired or would have to come down, but the latter may be the best option if it could not be inhabited long term. He said there was some subsidence beneath the building, and a decision could be made in the next few days, if not today. The BP House building was down over the last few months, because that had earthquake damage back in 2013. Figure 1. View of Molesworth Street. No. 61 Molesworth is the grey building with white columns. Molesworth Street runs past Parliament and the National Library. It connects to the motorway and is a major thoroughfare for commuter traffic. The evacuated buildings included New Zealand Rugby, St Paul’s Cathedral, the Thai Embassy and the Red Cross. There was damage to two floors of one corner of the Statistics House building, which houses 500 staff. (Figures 3 and 4). Engineers have advised that it could be several months before the building can be reoccupied. Teams based at NZ Post will also not be able to return this week. Pipitea street closed over falling debris fears. A nearby street in Wellington has also been closed because of concerns debris may fall off a building. Civil Defence has cordoned off Pipetea Street in the central city, as it was worried about the facade of Pipetea House – the offices of the Security Intelligence Service. Civil Defence said people who usually walked through the affected areas should look out for guides who would point them to an alternative route. Police will be stationed on the corner of Mulgrave and Aitken Streets to direct traffic. People working at nearby buildings – including New Zealand Rugby House, St Paul’s Cathedral and the Thai Embassy – were hurriedly told to evacuate yesterday, and it was unlikely they would be allowed back in today. Some houses accessed off Collina Terrace have also been evacuated. The Wellington headquarters of the Defence Force has been deemed uninhabitable following Monday’s quake. The multistorey office building at 2 Aitken Street (Figure 5) was built four years ago. Its 1200 staff may not be able to return for a year because of damage. Figure 5. Defence House, Aitken Street, Wellington. Engineers were assessing the Greater Wellington Regional Council offices. Council chairman Chris Laidlaw said subsidence opened up gaps between the bottom of the walls and the floor. He said it may be weeks, or longer, before all of the nearly 300 council staff returned. Some CBD areas, including Featherston Street, remained cordoned off because of the risk of further glass and debris being dislodged by strong winds. Engineers assessed the Westpac Stadium and cleared it of any major structural damage. The internal concourse and seating bowl would stay closed until repairs were completed in about two weeks. The earthquake burst water pipes, cracked concrete, broke windows and caused liquefaction on the stadium ring road. The residents of Tennyson Apartments (Figure 6) were evacuated this afternoon. Fire Service spokesperson Michael Wanoa said engineers had deemed the building unsafe, and called the service at 11.30am for help getting people out of the building. He said Urban Search and Rescue workers were at the building, on Tennyson Street, and it was not known at this stage how many people were affected. About three quarters of the street had been cordoned off. Other nearby buildings had also been evacuated, including an early childhood education centre. Figure 6. Emergency services vehicle aids in the evacuation of Tennyson Apartments. Figure 7, from the Geonet website, shows the locations of the mainshock and aftershocks that occurred in the first 24 hours. The aftershocks extend all the way to Wellington, implying that the earthquake may have ruptured all the way to Wellington, as indicated by the USGS slip map (Figure 2 of Briefing 1). Is so, then the closest distance from the earthquake rupture surface to Wellington could be as little as 20 km, assuming that the fault plane underlies Wellington at about that depth. Indeed, the USGS Shakemap (Figure 8) shows that the ground motions in Wellington were quite strong, between about 10% and 20%g, sufficient to damage vulnerable buildings of the kind described above. By comparison, the ground motions recorded in Christchurch were quite weak, typically less than 10%g, although it is closer to the epicentre than Wellington. This occurred because the earthquake rupture initiated at the epicentre and ruptured away from Christchurch and toward Wellington, focusing most of its energy in that direction due to rupture directivity effects. Also, as suggested in Figure 7, Wellington may have been closer to the fault rupture surface than Christchurch. This indicates the pitfall, commonly seen on the media, of representing the earthquake as a point source with concentric circles of radiating waves. Figure 7. The locations of the mainshock (largest circle near the southwest corner) and aftershocks that occurred in the first 24 hours. Figure 8. Shakemap of the earthquake, with triangles indication recorded values and contours using these recorded values onshore. The epicentre is shown by the large orange star. Source: USGS. As has been evident in media coverage, the earthquake has caused major disruption to transportation and communication lifelines due to ground failure of all kinds on a large scale, including landslides, rock falls, and soil liquefaction. There have been many failures (cracking and slumping) of road and railway embankments. Kaikoura’s road and rail access is blocked in both directions, and Civil Defence says 700 to 1000 people are still to be evacuated. Power and water have been restored to Kaikoura, but not drinking quality water. Landlines are still down in the area, and cellphone service is patchy. However, there is now limited road access to Kaikoura for military and essential services vehicles only, and between Seddon and Ward for essential services and residents. Kaikoura is being supplied and evacuated by air force helicopters and by ships that fortuitously are in the vicinity for a 75th naval anniversary event planned for Auckland and have now been diverted to Kaikoura. The navy vessels will be joined later by a frigate and a tanker ship, and American, Canadian and Australian ships are joining the rescue and resupply operation. NZDF hopes to have evacuated the majority of people in Kaikoura by the end of the day today. Federated Farmers are using helicopters to find out what damage has occurred on farms and what support isolated hill country farmers need in the Marlborough district (Figures 9 and 10).